Some quirks in their research; “three in one” is deceptive in the case of this vehicle! The Soviets always tried to come up with the lowest common denominator for mass production: pick one good design, and then put them into mass production at two or more factories. As a result, they rarely had a singularly outstanding weapons system, but they had very good ones and a lot of them. Such was the case with the T-34, which had been picked just prior to WWII to be the standard medium tank. The “home” or lead factory was Factory No. 183 in Kharkov, and it was to be followed by Factory No. 112 - “Krasnoye Sormovo” - and then the Stalingrad Tractor Factory (STZ) in getting the tank into mass production of more than 2,000 tanks per year. After the war began, on 25 August 1941 Factory No. 183 sent five knocked-down T-34 Model 1941 tanks to Factory No. 112 along with nine machine tool jigs and five “kontovateli” – a very large barrel-hoop shaped rotating jig for welding the hull components together. As Factory No. 112 had been working on partially knocked-down T-34s for some time, they were prepared and had two of the hulls finished by 1 September. In that month they received another 35 knock-downs from the armor factory at Mariupol’ and made 48 more on their own. Due to the fact that the armor plate they were manufacturing was quite hard and edge welding was not as reliable as needed, they switched to a “notched” construction design to fit the glacis plate to the hull sides. Prototypes were finished by 25 October and then full scale production commenced. Documentation was provided to the STZ; they later adopted a similar style but used it for both the glacis and upper stern plate. Other than the “notched” assembly at the front, the hull “signatures” of Factory No. 112 tanks were the large hinges at the rear for both the air exhaust grille and the entire upper plate. The upper rear plate also introduced a round access hatch held in place by four bolts; later this was modified to a larger one held in place by seven bolts but offset slightly to the right. The turrets generally matched the Factory No. 183 designs (e.g. with or without the rear bolted hatch for gun barrel replacement access; without it the turret had to lifted by a crane and tilted forward to get to the barrel) but with some minor changes in form and shape. The other item that distinguished Factory No. 112 tanks from the rest of the T-34s were the fact they sported more handrails for “tankoviy desant” riders than any others – up to four on the turret and 14 on the hull! Factory No. 112 built this design well into early 1943 before they changed to the six-sided “Gayka” turret design. I haven’t found the changeover point yet but there were probably more than 2,900 of these tanks built. 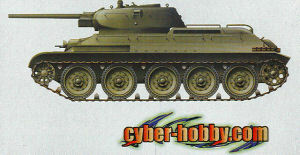 So far cyber-hobby.com has been hit or miss with their “boutique” versions of the T-34 series tanks; their STZ Model 1941 was nicely done but the STZ Model 1942 was riddled with simple and annoying errors, most of which related to the hull. Happily, this kit is mostly a “hit” as they got much more right with it. The kit adds two new sprues to the tried and true DML T-34 Model 1941 molds – a new sprue with two stern plates and two sets of rear air exhaust grilles – and a new turret sprue with a lovely new one-piece turret shell for the cast turret. They also provide the very early model T-34 Model 1940 tracks on sprues but then happily add the “Magic Track” links from their premium T-34-85 kits. Since many Russian sources attribute this design to Krasnoye Sormovo, and it was the one used on nearly all of their tanks, it is more accurate for any of the tanks produced after October 1941, which this kit represents. The old parts provided with this kit are tried and true, and have generally been well received by modelers. Suffice it to say there are still the usual quirks that must be dealt with, such as the late-model double bump stop on the lower hull molding; as it can’t really be seen when the model is assembled, it is not right but pretty much a “so what” correction. The front glacis plate for this kit (P-1) has the “notches” molded in place (unlike the STZ 42 hull which had them molded in place on it) and as such care will have to be taken in installing it to the hull body. The kit also provides the “bars” that were welded to the hull to protect the turret race. Both of the Factory No. 112 hull stern plates and access hatches are included, but only the later one has the wide hinges on the air exhaust grille. The hatch is missing the top bolt, but that should be easy to replace from one of the other two stern plates (one of which is not used at all). Note that there is no verifiable data on what constitutes a “gasser” or M-17T powered T-34. The early grille which cyber-hobby.com calls the “gasoline” grille is really the pre-June 1941 design which had a taillight ensconced in the notch; later ones either did not use one or provided only a wire and fitting for a detachable one. The turret is a nicely done new sprue (T) which includes a one-piece shell (thanks to “slide molding” for the Factory No. 112 type castings. Note that the bead around the front of the shell is weld bead and NOT a seam to remove! Also note that the turret comes with two hatches, of which the second one (T-3) is the more common hatch for this tank according to the “Top to Bottom” books. The model comes with an early type PT periscopic sight/viewer without the more popular “acorn” shaped cover found on T-34s. The modeler has a choice of three barrels for the F-34 gun: two-piece, one-piece with hollow bore from “slide” molding, and a turned aluminum one. A gun breech and partial interior to the turret are provided as with all of the DML T-34 kits. All 16 hand rails for the tank are included as well as at least two spares or alternate ones. The model doesn’t really come with specific finishing directions other than to paint the tank Soviet armor green (shade 4BO to the Soviets) and only provides specific info for one tank, “From the Workers of Kazakhstan” with a “number jungle” to create specific vehicles. Use of two or three digit numbers at this stage of the war was common, but most of the latter only started with 1, 2, 3 or occasionally 4 and the rest never went much above 22 or so as tank companies were only 7 to 10 tanks in size and battalions 22 to 31. The sheet is from Cartograf and provides three different styles of numbers. Overall, this is a much better kit than the STZ 42 and possibly the best of the DML T-34s so far.